The challenge in making this painting into a Frodo manip was that the teacher was so huge compared to the student. The student pictured is not a little boy. Therefore, I saw my first task as reducing the difference. I tried cutting out the boy's figure, making it larger, and pasting it back in. That did not work at all. 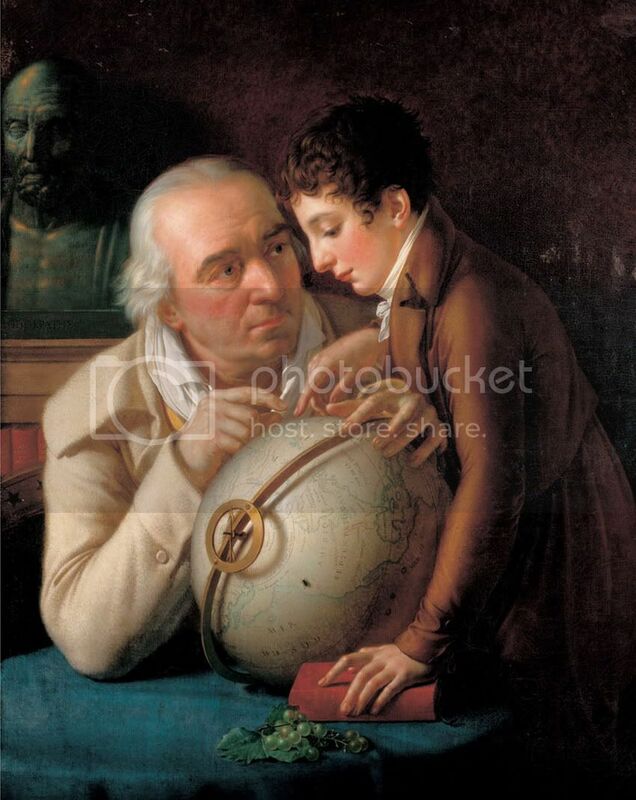 I studied it some more and noticed that it was the teacher's head that was so disporportionately huge, not his whole body. So I cut out the teacher's head and, after tinkering around for the correct size, pasted a smaller one back in (using the clone brush to fill from the background made empty, making some additional collar, etc.). With a little fine-tuning, the newly-sized teacher's head fit imperceptibly with the teacher's original body. Frodo’s head required the usual tweaking for colour, contrast and sharpness match, plus hair work, along with making a tiny bit of collar. The only “new” thing I did to him (that is, an effect I hadn't tried before) was to add some colour to his face. Because Frodo’s make-up is so wan in the Grey Haven’s scene, the screencap didn’t quite suit. The teacher’s face is extremely florid, which made Grey Havens-Frodo look even more pallid. Using the “add tint” brush, I could bring faint colour to the suitable places on Frodo's face. At the end, I added a very faint grainy filter, to help blend everything. 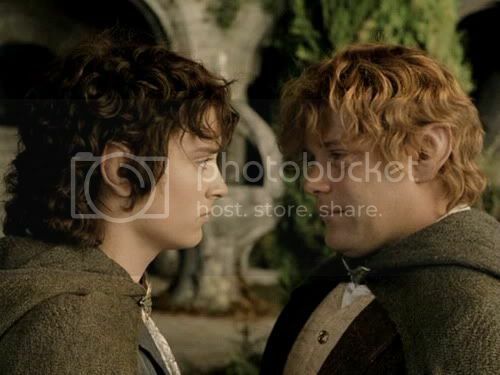 Of course, this manip could not possibly be a literal illustration of Frodo and Bilbo in LotR. In it, Bilbo’s hair is straight and the “map” they are looking at is a [relatively] modern globe. It is not at all the sort of thing Bilbo would have had in his study. Even if Bilbo did already have access to tales telling of Numenor’s folly and how the world was made “bent” (round), Bilbo’s maps were always described as things drawn on paper. Bilbo had maps of the lands beyond the Shire at Bag End, but the youthful Frodo did not seem to have paid much attention to them, being fonder of stories than maps. In LotR, it is noted of Merry, not Frodo, that he studied the maps available in the house of Elrond. My guess is that Bilbo took his maps of the wider world with him when he left, since they would be necessary for his journey. Moreover, early in FotR when Frodo actually is looking at Bilbo's maps (after Bilbo's departure), the maps described are from the Shire. But even if Frodo hadn't paid much attention to maps as practical navigational aids, he was aware of what they implied. They provided glimpses or hints, like runes, pointing towards the unknown; to that which was far away in both space and time; that is, towards Adventure. I think the finished manip gives a sense of that awareness. 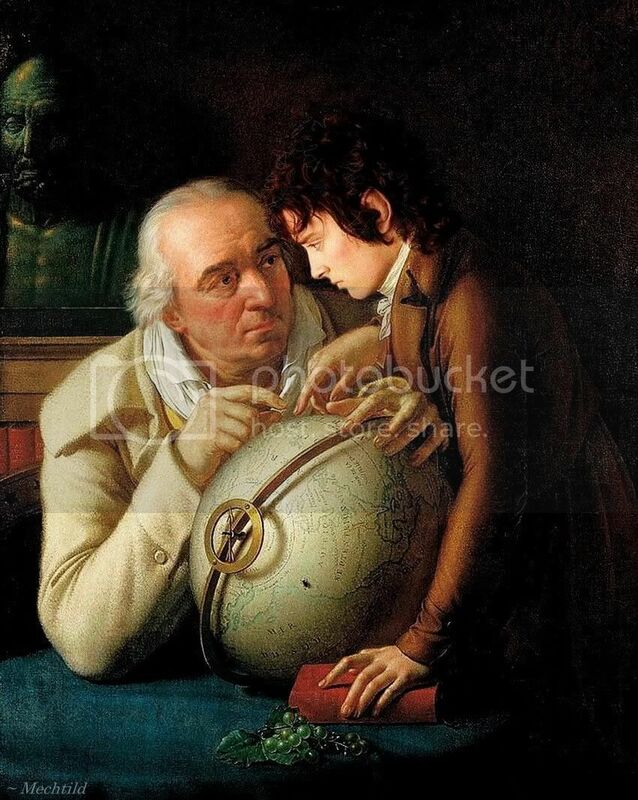 To me, the scene in the manip suggests Bilbo explaining a point of geography to his newly-adopted heir. “And here is the eastern edge of Mirkwood the Great, my lad, where the Forest River falls towards the Long Lake before it turns to marsh.” But Frodo is thinking, “Mirkwood ... what a wonderful-sounding name. Foreboding, even dreadful, yet it fills me with awe....” Bilbo might still be going on about plants and waterbirds, but Frodo is thinking of narrow dark paths, trees looming over him, the skittering sounds from things unseen in the tangled undergrowth, all of it giving him chills -- but chills of pleasure, for these things are not yet real for him. They still are things out of tales, things that happen to other hobbits. In the opening of “The Shadow of the Past”, it is written of Frodo as he reaches his fiftieth year that he is thinking of Bilbo. He is beginning to feel restless, finding “the old paths too well-trodden”. He looked at maps, and wondered what lay beyond their edges: maps made in the Shire showed mostly white spaces beyond its borders. I think that expresses rather well what I glimpse in this manip, Frodo as a youth, newly come to Bag End. And isn't Tolkien wonderful? I love how much he can imply with the seemingly simple image of the "mostly white spaces" beyond the map's borders. White spaces. White light. White shores under a swift sunrise. Find other Frodo Art Travesties LJ entries HERE. View Frodo Art Travesties album of images HERE. Your contibution to Hobbitmonth is so beautiful, darling Mechtild! I always love the way you take wonderful works of art, and explain how you insert Frodo-Elijah... and I bless you for doing it here! Thank you, Hobbitlove. You are most kind. Actually, I didn't think of telling more about how the manips were done until I started reading the journal of bandwench whose manip-making craft is excellent. In her entries, she often explained who she made each piece, providing images of the "parts" she used. I really loved that. Wow! I like your manip better than the original! Really well done. Thank you, Mariole. But I am only on my second coffee? Which excerpt do you mean ("makes it look like Frodo is in the professor's lap...")? The only excerpt is the one about Frodo looking at the Shire maps. I am too muzzy this morning. Thank you for inviting me to participate, Frodosweetstuff. Thank you so much, Mews. The light really is good. I tweaked the contrast in the copy of the painting I had, in order to bring out the lighting better. I am glad it worked so well for others (besides me, that is). You amaze me! How you find a wonderful piced of art, the perfect picture to insert in it, and make it so seamless it's as if the other pictures never existed, just this one piece of art as it should/could have been! Belleferret, you are very kind. I am just lucky that there are so many galleries available to browse on the web. Pictures just sort of "pop up". I saw this one quite by accident, looking up this artist for a different work altogether. What a find, though. Absolutely gorgeous! And your explanation was totally fascinating. I loved this so much! Why, thank you, Rakshi, and welcome! I'm just blown away. Your manips are amazing. Frodoholic, thank you. And your icon shepherd (the Gayton) is doing the perfect pose for your comment. You are so droll! With no offence for the artist, but I think that your manip is much better than the original painting. You did wonder in manipulating Frodo, but Frodo's face is so perfect that it fits well in classic paintings. Thanks a lot, dearest, hugs you! I agree with the comments above: your manip is much better than the original painting! :) It's beautiful, and pictures young Frodo fascinated by maps and strange lands wonderfully. Thank you! Thank you, Bagma. I am glad you got to see this. I am truly pleased with it. It may be my last manip in while, too, so I am glad it's a "winner". Fantastic work, Mechtild!! Again, you did a super job. :-) It was worth the wait - you *improved* the original painting without any doubt, not only by inserting Frodo's face, but also through giving 'Bilbo's' head a much better size. Madame Girodet should be more than grateful. The face you chose is simply perfect. Together with the teacher's head it creates a wonderful intimate moment between the two of them. I *love* Frodo's slightly rosy cheek. Wonderfully done! Thank you, Whiteling. I do think Girodet got the proportions wrong. Unless he meant the hugeness of the mentor's head to imply his mental prowess. Or, it could be that his model had a huge head. Yes, the rosy cheeks are an improvement. I added a little to his forehead, nostrils, lips and ears, too. Not enough to notice individually, but enough to bring up his colour in a general way. But, you know, I wondered about the gender of Girodet, too, because of the "Anne" in the "Anne-Louis". But the sites I looked at all said he was a man. Perhaps the use of the feminine name is like that in the name of the composer, Carl Maria von Weber. His middle name is "Maria", which is definitely a woman's name. Perhaps "Anne" was his saint name, just as "Maria" might have been Weber's saint name? This is a beautiful glance at Bag End life and into the relationship between Bilbo and young Frodo. I have always imagined Bilbo, during the long winter evenings, explaining to Frodo strange subjects: runes, elvish, lore of other peoples, geography, botany of far countries. I have pictured him very pleased in teaching those ‘tookish’ matters, so typical for mad-Baggins. Frodo singularity among the other Hobbits was due also to his open-mind interaction with Bilbo. It’s amazing that you used the Grey Havens scene for that warm coloured picture. The result is beautiful and, I will repeat other comment, more interesting then the original. It’s always a pleasure to go into LotR story with your manips. Thanks, Mechtild! Thank you, Estelanui. What you said about their long winter evenings is the sort of thing that came to when I first saw this picture and imagined it as a manip. Until I began reading fanfic, I rarely thought about Frodo's life before the start of the novel. Now I do. While I have enjoyed many stories of Frodo's childhood and early life at Bag End as one full of trials and upheaval, a Frodo who runs about in rags or mucks out stables, left in virtual ignorance by hardened relatives until Bilbo can tame him, I don't think such portrayals have much to do with what is implied in the text. I think this picture is much more the sort of thing I had imagined, although the style of things in it is too recent, so many of the furnishings being things that are the products (directly or indirectely) of the Industrial Revolution: a well-off gentleman in a well-off gentleman's home, leading a well-off gentleman's life (who can afford to be accentric), imparting his knowledge to his well-born, well-brought-up ward. And THX a lot for explaining how you did it. That was interesting. Thank you, Roxy, and welcome. I am pleased that a few people liked the technical explanation part; I always appreciate hearing how people make the things they post, being someone who is learning as she goes. This is wonderful, Mechtild. Frodo looks wary and doubtful, as if he is seeing deeper than the map itself, and Bilbo looks knowing and yet encouraging at the same time. Perfectly done, as always, and yes, much better than the original. Thank you for posting up a little on how these beautiful pictures are made - I've always been interested to know. Thanks, Igraine. Yes, I think it turned into a very evocative picture. As I said, it can't be a literal illustration, but I think it does what a good illustration does: it leads the viewer more deeply into the story. I remarked above that it only occurred to me to say more about how the manips are made rather recently, browsing the LJ of bandwench, a maker of EW manips, who is wonderful about explaining her techniques, often posting her source images. She's such a craftsperson, though, she might use four or five images in one piece, plus a bunch of filter effects I've never heard of. While the content of her manips is not always what I appreciate, her skill is very impressive, and her explanations excellent and warmly written. That looks as if it ought to be an illustration in the book. It's quite perfect. Thank you for sharing it for Hobbit Month. And thank you, Ilbilover. You are gracious. Have I ever told you how much I love your icon? I'll bet I have. Well, I love it. Is it from a Book of Hours?